Back with a very quick update, recently I wrote a post about the different options for limiting the use of an EPM Cloud application to administrators and then returning it to all users. At the time of writing the post, the only option to schedule this process was by creating a refresh database job and setting the enable use of application settings. 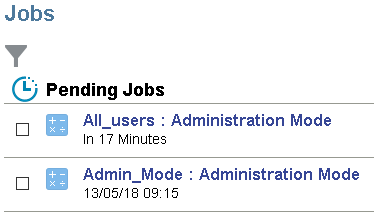 Moving forward to the 18.05 cloud release and there is now a new schedule job option called “Administration Mode”. So if you know the exact times you want to limit access to the application, you can create a new job. It is possible to run the job straight away which would really be the same as going to “System Settings and Defaults” from the navigator, this then provides the options to set the application maintenance mode. Anyway, once you have defined the frequency you then have the option to enable the use of the application to administrators or all users. 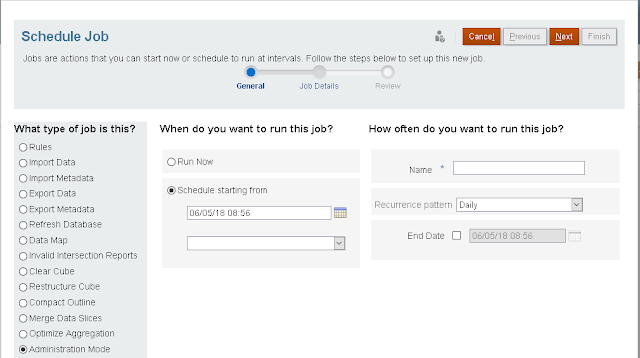 You can then create another job to return the application back to all users. This time you would select the use to “All users”. This will be the case until the job to return the application to all users runs or the system setting is changed in the UI. 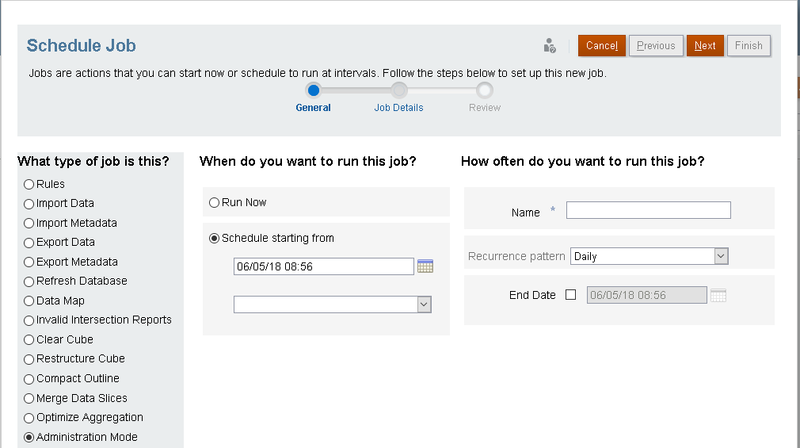 The next time the schedule jobs are set to run will be available under pending jobs. So what if you don’t know the timings of when you want to limit access to the application (as you may want to include it as part of a scripted process)? Well unfortunately it does not look like Oracle has decided to provide the option to do this using EPM Automate or the REST API yet. In this case you can look at the possibility of trying out the method I provided in my recent post. I am hoping Oracle will include this at some point in the future and if they do I will provide a further update. Thanks for this John, I have the need to enable/disable PBCS administrator mode during batch operations because users are able to pulling incomplete data, leading to data integrity questions. I'm disappointed that it's not currently possible outside of refreshing the app, which isn't really an option in my environment for a handful of reasons. I created an SR two yesterday requesting this feature, the status is "Oracle Working" "Awaiting Internal Response". I'll post back with the outcome. Thanks Jeff, I interested to hear what the response will be from Oracle, hopefully it will be positive.